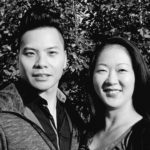 Kevin and Sheena started dancing while studying at the University of Alberta. It didn’t take long for Kevin and Sheena to discover their passion for ballroom dancing. Under the tutelage of Dominic Lacroix, Delphine Romaire, Benoit Drolet, and Danny Quilliam, they’ve enjoyed a lot of success over the years. They currently compete at the Championship level across Canada in both ballroom and latin dance. Some of their accomplishments include placing 3rd in Canada in the 30+ age division in ballroom, 3rd in Canada in the 30+ age division in latin, and 2nd in Canada in 10 dance. Kevin and Sheena teach students of all ages. Whether your goal is to compete at a competition, to dance comfortably in a social setting, or wow your guests at your wedding, Kevin and Sheena believe that they can help you reach your dance goals.